Camping fees range from $24 to $33 a night. There is an additional fee for a fire permit (free high-quality fire wood included) for the campgrounds that permit fires. The only accommodations that come close in price are the dormitory rooms in the hostels which are in the $40 to $50 range. 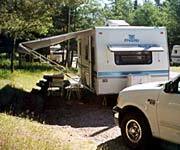 The disadvantages of the campgrounds are that you need a tent or RV. Tunnel Mountain Trailer Court and Tunnel Mountain Village 2 are within walking distance from the downtown section Banff Townsite (2.4 kM). It's a down-hill walk, so the walk back may be fairly aerobic. Tunnel Mountain Village 1 is a more ambitious walk (4 kM). 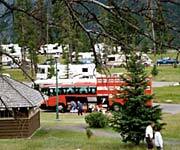 All have public bus transportation ($2 per adult, 2009) into the downtown section of Banff Townsite and connections via transfer to most of the tourist attractions. For details of other fares, discounts, routes, schedules, and route maps see Banff Public Transit Buses. When you arrive at Trailer Court or Mountain Village 2, a loop approach provides ample room for a line of RVs at the entrance kiosk. At peak times, rangers help direct traffic. When you reach the kiosk you will be assigned a campsite and pay any fees owed. To your right is the Trailer Court. A forested slope has long terraces cut into it and most of the campsites are located in loops off the straight terraced roads. The loops are staggered on each terrace which gives a sense of forested privacy to each pull out. Half of these are pull through's, no backing required. To your left is Village 2. This is mainly a paved and grassy flat area. The campsites are the same size as the Trailer Court, but are more crowded upon each other. Still there is a general feeling of openness because of the lack of forrest. Sites: 321 gravel sites 20 x 60 feet with full hookups (water, electrical, sewer). Half are pull-thrust. Facilities: Washroom buildings with flush toilets and showers. Dump station, and public telephones. No camp fires. No tents. Tunnel Mountain Trailer Court was the first place we stayed in Banff and it has formed our home base for every trip since. 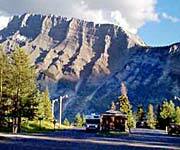 Sure, we have stayed in beautiful campgrounds in Jasper and other Canadian Rocky Mountain locations. But the Tunnel Mountain Trailer Court is our Banff home, not only because of the good memories, but because no campfires are allowed -- the smoke can sometimes trigger a migraine in Jerry, which tends to put a damper on a vacation. An elk greeted us the first morning we were in camp. We opened the door and through the screen just to the left of the picnic table an elk was having its breakfast. We were excited, but not nearly as excited as our cat Snickers, who truly did not know what to make of these large critters. Soon she learned to ignore the large critters and only get excited when she saw one about her size. An elk sighting the next year was even more interesting. A woman in the terrace below us was reading a book under her trailer canopy. An elk came grazing about 10 feet from her and continued grazing for about 20 minutes. With her back to the elk, she never saw it. We debated whether to call down to her about her friend but decided not to in case she had a weak heart. Elk are common in Banff. The elks enemy, the wolf, is quite shy and rarely comes into the city limits. The elk, not being dumb, spend a lot of time in the city limits and you will see them in quite surprising places. Sites: 188 electrical-only sites. Paved pull-thrust, 20 x 60 feet. Facilities: Washroom buildings with flush toilets and showers. Dump station, firewood, and public telephones. Interpretive Program: Says No, but shares Trailer Court program. The red tour bus in the foreground of this view of Tunnel Mountain Village 2 is quite unusual. The front upper deck is like a conventional bus with good sight-seeing windows. To the rear are sleeping compartments that provide a place to sleep horizontally. Underneath is a large storage compartment for baggage. The gazebo in the front left is a group cooking and eating area, protected from the rain, where the group eats. Since it frequently rains in Banff, the rain shelter for cooking and eating is quite functional. Conventional RV's are seen in the background in their paved pull-through. From our observations, this campground seems to fill up sooner than the Trailer Court. Facilities: Washroom buildings with flush toilets and showers. Dump station, fire pits, firewood, and public telephones. 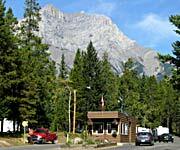 Tunnel Mountain Village 1 is located further from Banff than the other two Tunnel Mountain campgrounds -- 4 kM from town. However, it is still served by public transportation into town with the bus stop next to the entrance kiosk. It seems to fill up faster than the other campsites -- often showing a campground-full sign most of the time during peak season. We drove through Village 1 one night just at dusk. In this huge campground, every site was taken and the campers who were going to have campfires had lit them. The Canadians seem to love to tent camp and love to gather around the campfire in groups. Row after row of people by the light of fire eating dinner, sharing a beer, and just enjoying themselves. It made us wistful for both our tent camping and backpacking days. Our base-camp trailer seemed a little isolated and lonely when we returned to it.